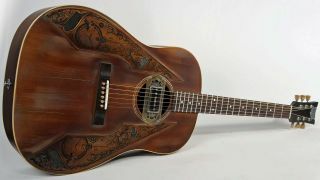 Oh, what we wouldn't give to own a Wild Customs acoustic guitar - the French brand is rapidly approaching the likes of Trussart in the lusted-after stakes, and now the company has dipped its toes in the world of ultra-desirable acoustics with the Harvest J-45. As the name suggests, the Harvest is based on Gibson's legendary J-45, but in typical Wild Customs fashion, there's a little more to it than that. Aside from the stunning maple etched scratchplates and Harvest Relic finish, the guitar is most notable for featuring a P-90 pickup mounted on a brass plate over the soundhole - so you can expect some very un-acoustic sounds when this one's plugged in. Unplugged, things are more typically acoustic, thanks to a Sitka spruce top, mahogany back and sides, plus a mahogany neck with rosewood fingerboard and bone nut. The Harvest J-45 is available now from Wild Customs for €4,489 - that's around £3,400/$5,000.